Part II: What Would it Take to Build a Bomb? What steps would be necessary for Iran to build a nuclear weapon? President Obama has estimated that it would take Iran “over a year or so” for Iran to develop a nuclear weapon. But that device would likely be crude and too large to fit on a ballistic missile. Producing a nuclear weapon that could be launched at Israel, Europe, or the United States would take substantially longer. Iran would need to complete three key steps. ·90 percent enrichment: The most likely route for Iran to produce fissile material would be to enrich its growing stockpile of low-enriched uranium to 90 percent purity —or weapons-grade level. Western intelligence agencies suggest Iran has not decided to enrich uranium to 90 percent. ·3.5 percent enrichment: As of early 2013, Iran had approximately 18,000 pounds of “low-enriched uranium” enriched to the 3.5 percent level (the level used to fuel civilian nuclear power plants). This stockpile would be sufficient to produce around half-a-dozen nuclear bombs, but only if it were further enriched to weapons-grade level (above the 90 percent purity level). Experts estimate Iran would need at least four months to produce enough weapons-grade uranium for one bomb using 3.5 percent enriched uranium as the starting point. weapons-grade uranium for a single bomb in a month or two. The main issue is the status of the uranium enriched to 20 percent and the two production sites—at the Fordo plant outside the northern city of Qom and the Natanz facility in central Iran. U.N. inspectors visit these sites every week or two, however, so any move to produce weapons-grade uranium in an accelerated timeframe as short as a month would be detected. Knowing this, Iran is unlikely to act. The speed of enrichment also depends on the centrifuges used, both their number and their quality. For a long time, Iran had used thousands of fairly slow IR-1 centrifuges to spin and then separate uranium isotopes. But since January 2013, it has started to install IR-2M centrifuges, which spin three to five times faster. In early 2013, Tehran claimed to be using about 200 IR-2Ms at the Natanz site. Tehran might be able to enrich enough uranium for one bomb ― from 20 percent purity to 90 percent ― in as little as two weeks if it installs large numbers of advanced IR-2M centrifuges. Iran has announced its intention to eventually install as many as 3,000. Iran would next have to build a nuclear device. It would need to build a warhead based on an “implosion” design if Iran wanted to deliver a nuclear device on a missile. It would include a core composed of weapons-grade uranium (or plutonium) and a neutron initiator surrounded by conventional high explosives designed to compress the core and set off a self-sustaining nuclear chain reaction. IAEA documents claim, “Iran has sufficient information to be able to design and produce a workable implosion nuclear device based upon HEU [highly enriched uranium] as the fission fuel.” The IAEA has also expressed concerns that Iran may have conducted conventional high-explosive tests at its military facility at Parchin that could be used to develop a nuclear warhead. There is no evidence, however, that Iran is currently working to design or construct such a warhead. Even if Iran made the decision, production of a warhead small enough, light enough, and reliable enough to mount on a ballistic missile is complicated. Iran would probably need at least a few years to accomplish this technological achievement. If Iran built a nuclear warhead, it would need a way to deliver it. 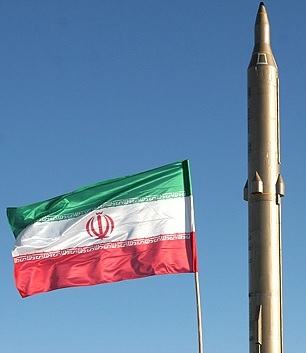 Tehran’s medium-range Shahab-3 has a range of up to 1,200 miles, long enough to strike anywhere in the Middle East, including Israel, and possibly southeastern Europe. These missiles are highly inaccurate, but they are theoretically capable of carrying a nuclear warhead if Iran is able to design one. Iran’s Sajjil-2, another domestically produced medium-range ballistic missile, reportedly has a range of 1,375 miles when carrying a 1,650-pound warhead. Tehran is the only country to develop a missile with that range before a nuclear weapon. But the missile has only been tested once since 2009, which may mean it needs further fine-tuning before deployment. Iran also relies on foreign sources for a number of components for the Sajjil-2. Iran is probably years away from developing a missile that could hit the United States. A 2012 Department of Defense report said Iran “may be technically capable” of flight testing an intercontinental ballistic missile (ICBM) by 2015 if it receives foreign assistance. But in December 2012, a congressional report said Iran is unlikely to develop an ICBM in this timeframe, and many analysts estimate that Tehran would need until 2020. Is the North Korean experience relevant? The Clinton administration confronted a similar dilemma in 1993 on North Korea’s nuclear program. The intelligence community assessed that Pyongyang had one or two bombs’ worth of weapons-grade plutonium. But the intelligence community could not tell the president with a high degree of certainty if North Korea had actually built operational nuclear weapons. The mere existence of a few bombs’ worth of weapons-grade plutonium seemed to have a powerful deterrent effect on the United States. Washington could not be sure where the material was stored, or if the North Koreans were close to producing a weapon. The same concerns could apply to Iran if it developed the capability to produce weapons-grade uranium so quickly that it avoids detection even at declared facilities― or if it was able to enrich bomb-grade material at a secret facility. Then Iran might be able to hide the fissile material, making it more difficult for a military strike to destroy. All the other parts of the program, such as weapons design, preparing the uranium core, and fabrication and assembly of other key weapon components, could potentially be done in places dispersed across the country that are easier to conceal and more difficult to target. Iran may be years away from being able to place a nuclear warhead on a reliable long-range missile. But many analysts are concerned that the game is up once Iran produces enough fissile material for a bomb. Colin H. Kahl served as the deputy assistant secretary of defense for the Middle East from 2009 to 2011. He is currently an associate professor at Georgetown University’s School of Foreign Service and a senior fellow at the Center for a New American Security.